Apple has released the first Mac OS X Lion update. 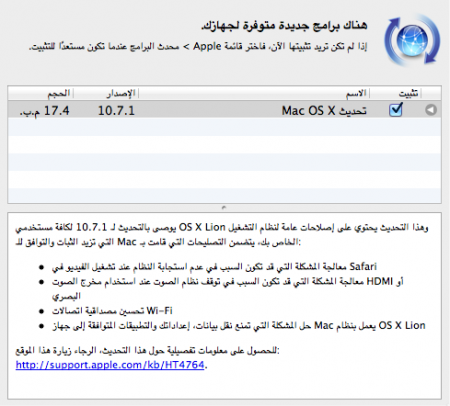 OS X Lion includes many fixes and as you can see from the screenshot it is the first official Arabic update notes from Apple. More information about the update is available on Apple’s website. To install the update click the Apple logo then choose Software Update. Apple also released OS X Lion Update 10.7.1 (Server), OS X Lion 10.7.1 Update for MacBook Air and Mac mini 2011 (Client) and OS X Lion 10.7.1 Update for Mac mini 2011 (Server).